The part-time, Evening MBA is a 21-month program designed to accommodate the schedules of working professionals. Classes meet twice a week in the evening, either Mondays and Wednesdays or Tuesdays and Thursdays. The program begins each August and takes five semesters to complete, with a break for the summer. The 42-credit program is comprised of 36 core credits and six elective credits, making it more rigid than many other programs with large degrees of customization. Students progress through the core requirements at the same speed over the course of the five-semester program. Electives are taken mostly online at a student’s own pace, and they also have the option of completing a 7 to 10-day international business trip for elective credit. An estimated 90 percent of graduates from the Evening MBA program earn job offers within three months of earning a degree. Tuition and fees for Colorado residents is set at $42,193 for the five-semester program, and $76,411 for out-of-state students. A few select scholarships are offered to part-time MBA students, as well as various grants, loans, and work study opportunities. 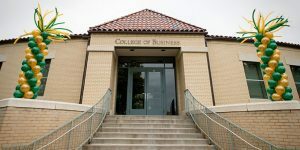 Unlike many other MBA programs, applicants to the part-time MBA do not need to submit a GMAT score, as the school believes that evaluating old test scores after several years of work experience is an antiquated requirement. A completed application consists of a data form, transcripts from all institutions attended with a minimum GPA of a 3.0, proof of at least four years of work experience, a résumé and a statement of purpose, and three professional recommendations.